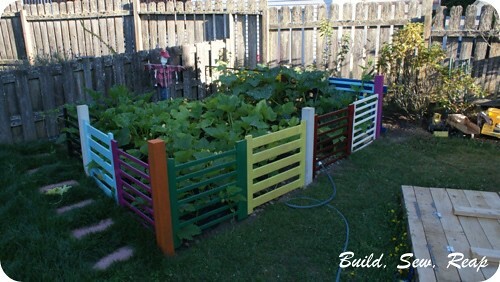 I've always thought a colorful fence around the back garden would be cute. I tried to think of lots of ways to make it playful but I didn't want to spend much. Basically I was willing to buy paint and that was it. 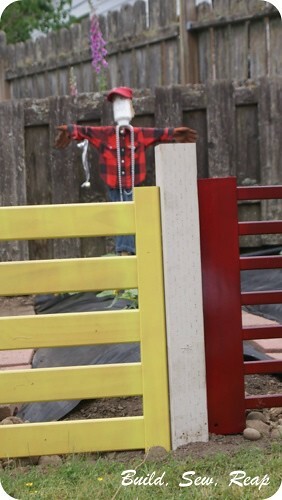 Then it hit me, I could make a great fence using the existing metal support posts, scrap 4x4s and crib parts! I solicited my neighborhood mom's group on Facebook and they came through with flying colors. It seems it's quite easy to get old cribs from people, particularly the drop side ones that aren't legal to use anymore. For some, I used the whole piece, for others, I cut the piece in half. 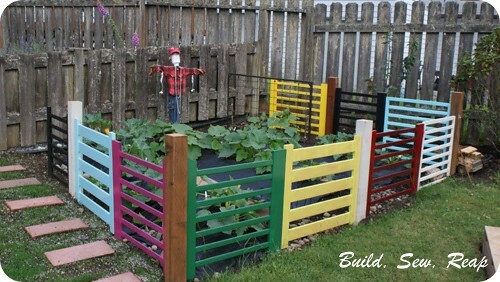 I painted them all with Krylon spray paint before installing them and used my Kreg jig to secure them to the 4x4 posts which I set about 18 inches in the ground. Here's what it looked like not long after I finished getting the panels installed. I inserted a 4x4 post so each piece would be supported on one side. 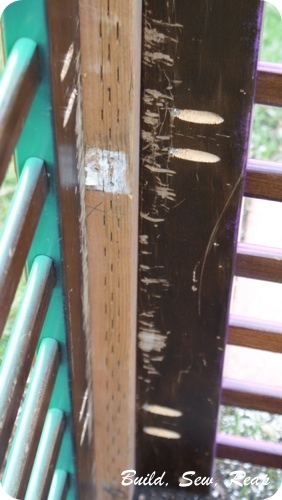 I used my Kreg jig to screw into the back side of the crib parts and into the posts. As you can see here, I didn't paint the back of all the panels, I was running out of paint. 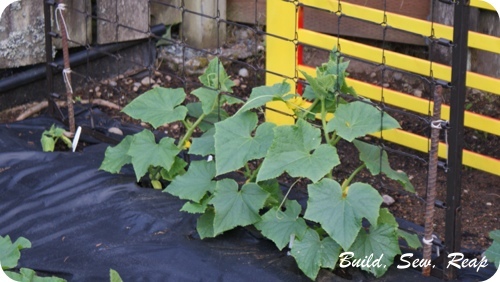 I also had an old crib springs panel which I'm using as a trellis for the cucumber vines to climb. I stuck some rebar deep into the ground then secured the springs panel to them. They're holding up quite well. When I planted out the plants that I had started from seed, the ground still wasn't as warm as it should have been so I first covered my mounds with some landscape weed blocker. I was using scraps so I needed to hold the edges down. I had a stack of pavers from our first garden so I just loosely laid those in rows between the mounds. I thought those would make nice paths too but then the plants grew and grew and grew and now I can barely walk in this particular garden. 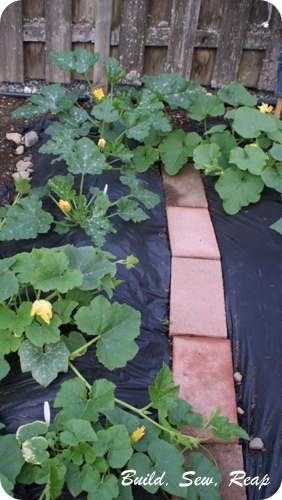 These are older pictures but we now have at least 8 pumpkins growing, we've harvested more than 10 zucchini and 7 pickling cucumbers. Yum!! If you'd like to check out the rest of our gardens, please click here. I had no idea you built this using crib posts?! It looks adorable. My favorite part is the different colors---and the use of the crib spring! Thanks Michelle. I forgot to include that the white cribs that I got were easier to paint but after just a few weeks in the sunshine and rain, they're cracking a little. Now, I don't mind because I like the weathered/rustic look but the stained ones are definitely holding their colorful paint better. Either way, it was a nearly free project and I love the pop of bright color in the back of our yard. Gardening ranges in scale from fruit orchards, to long boulevard plantings with one or more different types of shrubs, trees, and herbaceous plants, to residential yards including lawns and foundation plantings, to plants in large or small containers grown inside or outside. Gardening may be very specialized, with only one type of plant grown, or involve a large number of different plants in mixed plantings.